One of the Vatican’s top canon lawyers at the Synod of Bishops on the Family says the current process for the annulment of marriages in the Catholic Church could be streamlined and expanded to the benefit of many people whose marriages have broken down. Cardinal Francis Coccopalmerio of Italy spoke at a Vatican press briefing on Oct. 9. His words carry particular weight since, on the eve of the synod, Pope Francis appointed him as a member of the commission he set up to study the annulment process. He is also president of the Pontifical Council for Legislative Texts. 1. Removing the appeal process and requiring only one judicial decision in the church’s tribunal. The current code of canon law requires the double confirming sentence by church tribunals before the marriage can be declared null. Now, after the first judicial sentence has been issued declaring the marriage is null, there is an automatic judicial appeal. The church cannot declare the annulment of a marriage until the appeal process has confirmed the first decision. 2. Not requiring a collegial judicial decision in cases of annulment. Currently it is necessary to have three judges declare the nullity of a marriage, whereas it would be sufficient to have only one judge for this purpose. 3. 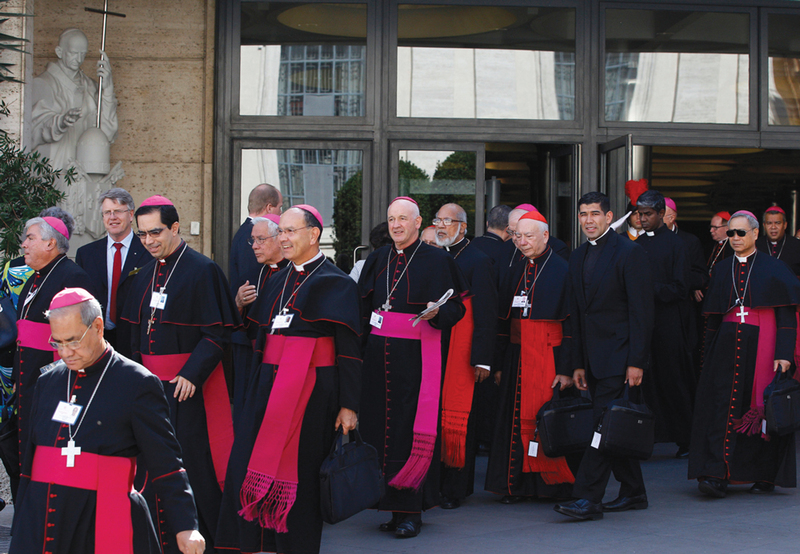 Allowing what many synod fathers described as “an administrative procedure,” by which the local bishop can declare the annulment of a marriage “for grave and urgent reasons.” This could happen even in the absence of external evidence or witnesses, when the bishop considers the couple themselves as “credible witnesses” to what was the actual situation in their marriage. “I am very favorable to this third solution; it is often the only way forward,” Cardinal Coccopalmerio said. “We must adopt the hermeneutics of the pope; we must adapt the procedure to the concrete situation of individuals for grave and urgent reasons.” He cited the example of what Jesus said in the Gospel regarding the man whose ox had fallen into the well on a Sabbath; he said Jesus did not abolish the law of the Sabbath that prohibited people from working on that day. Rather, he indicates that action had to be taken here for grave and urgent reasons. Referring to this “administrative procedure,” the Italian cardinal said, “It cannot become a general norm, but it can be a situation in which the local bishop can decide case by case.” Cardinal Coccopalmerio noted that people have long complained about the length and cost of the annulment process. Moreover, he said, there are many dioceses in Africa and Asia that do not have tribunals, so the judicial process is not a viable option there, whereas “the administrative procedure” is workable everywhere. “If the synod supports this, then we’d get a big result,” the cardinal, who is an expert in canon law, predicted. So-called "streamlining" still seems to rely upon discovering some defect in consent so as to claim the marriage was never truly "sacramental" or otherwise valid. It still requires some kind of penitence for letting the marriage fail or for entering it in the first place. Ultimately there is no room for a non-defective marriage which later falls apart. The annulment process itself can be a fraudulent attempt to prove the unprovable. When divorce was rare, there were many abandonments, people moving on with their lives in hope. All the divorced and remarried ask is to be allowed to return to the sacraments for spiritual nourishment. Why can't we leave them be? Mike Evans' comment is a very strong and simple argument based in the need of spiritual nourishment that all we have. This is true christian charity..!. This article also appeared in print, under the headline "Synod Leader Suggests Steps To Streamline Annulment Process," in the October 27, 2014 issue.